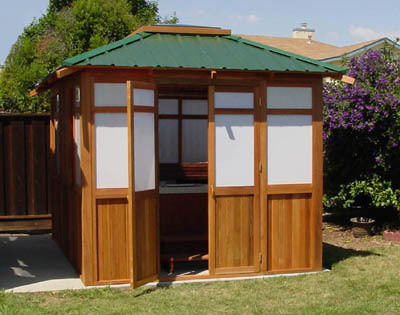 The Pacific 8'x11' is a very universal spa enclosure with extended rectangular shape. To fit a 7'x7' spa, there will be about 4' extra room in front of the spa. In that space, our customers typically put a set of patio chairs, towel rack or spa chemical cabinet there. Sometimes a TV or stereo system will be added at the corner. 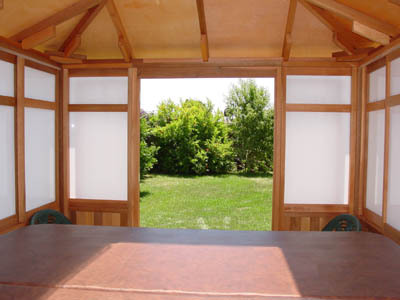 When you open the gazebo windows or doors, your beautiful garden views are around. Wall: the wall base is 3' high with Tongue & Groove cedar skirt, on top are 4' high tinted Plexiglas windows. Skylight: 3' x 6' bronze dome skylight made with aircraft grade acrylic and UV protection property. 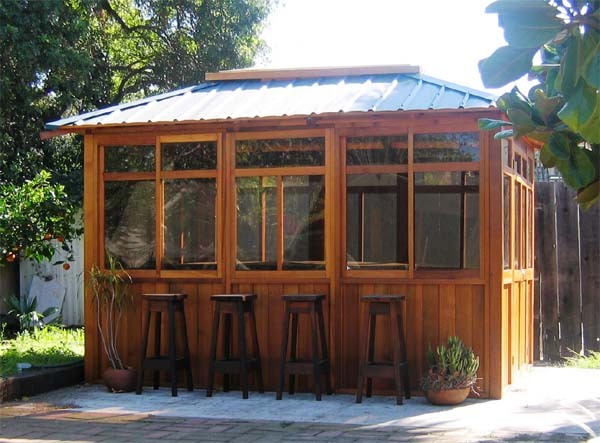 Wall Dimension: outside 103"x139", inside 96"x132"
Metal wood Roof: with Brown, Green or Blue color choices.